Marine 31 Gel Coat Final Step Polish utilizes advanced diminishing abrasives that take little bites out of the gel coat, removing light oxidation, surface staining and other gloss-hindering imperfections. Marine 31 Gel Coat Final Step Polish is the ideal polish to use on boats that are well maintained and simply require a light polishing before boating season begins. No longer is it impossible to make standard gel coat shine like painted gel coat! Marine 31 Gel Coat Final Step Polish is rich in nourishing oils that penetrate deep into the gel coat as you polish, maximizing gloss and providing a wet-looking finish. 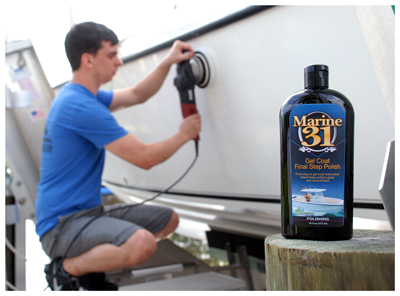 What�s more, Marine 31 Gel Coat Final Step Polish is incredibly easy to apply and remove, even in direct sunlight! Marine 31 Gel Coat Final Step Polish can be applied by hand, circular polisher or dual action orbital polisher. What's more, Marine 31 Gel Coat Final Step Polish is harbor safe and eco-friendly. Apply an �X� of product directly onto polishing foam pad and spread product over a 2� by 2� area. Circular polisher: Set speed between 600 and 1000 RPM. Random Orbital polisher: Set speed between 4000 and 5000 OPM. After polishing, apply a coat of Marine 31 Gel Coat Carnauba Wax + Sealant to lock in the shine and protect the finish.